In this most unusual of moments, there is a great deal of angst in the destination marketing world about the outlook for international visitation to the United States. Travel bans and outrageous rhetoric suggesting the possibility of “extreme vetting” for tourists from markets like Germany and France have analysts predicting that foreign demand for American travel product will fall sharply this year. While this situation is an extraordinarily serious problem, signs from domestic travelers point in the other direction. Our recently finished Spring edition of The State of the American Traveler™ shows that, at least on the home front, the outlook for leisure travel is surprisingly positive. In fact, Americans are planning more trips and more spending in the upcoming year than ever before, pointing to a strong performance in the remainder of 2017. According to our April The State of the American Traveler™ tracking survey, more Americans than ever are expecting to increase the number of leisure trips they will take in the upcoming year. Leisure travel optimism is at a record high, mirroring positive trends seen in more general consumer confidence indices. This enthusiastic outlook is illustrated by a record 39.7 percent of Americans saying they expect to travel more for leisure in the next year, up from 37.9 percent in January. Leisure travel spending expectations are also high, with 39.3 percent of American travelers expecting to increase their leisure travel spending in 2017. 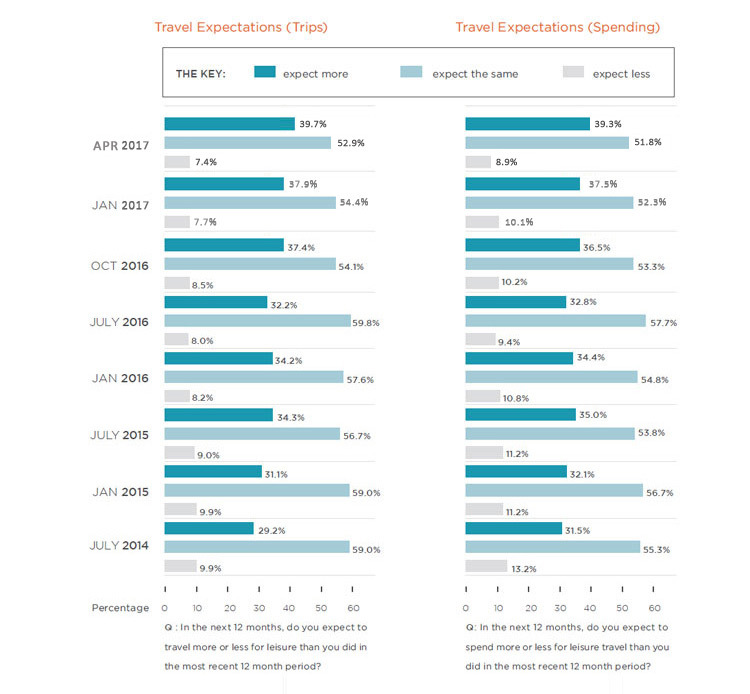 The chart below shows this strong optimism, illustrating the share of American leisure travelers who (in the next 12 months) expect to travel more, less and the same as they did in the most recent 12-month period. Meanwhile, future travel sentiment across the country remains somewhat uneven, with residents of the West coast showing the highest levels of optimism for travel in the upcoming year. 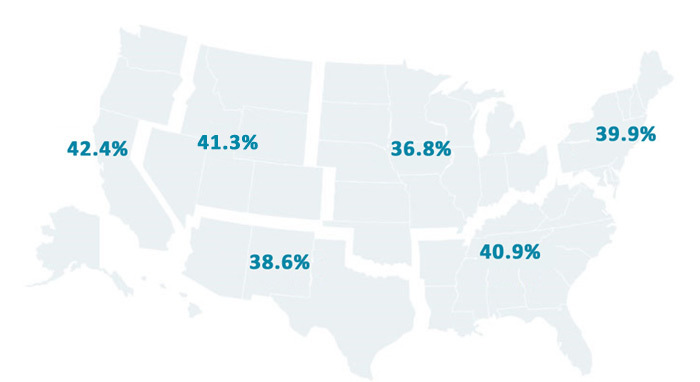 42.4 percent of residents of the Pacific Coast region expect to travel more in the upcoming year, while 39.9 percent of travelers living in the Northeast and 40.9 percent in the Southeast expect to increase the number of trips they will take in the next year. So, there we have it. Despite the fact that international visitation to the U.S. is predicted to decline, American leisure travelers are ready to go; planning to take more trips and spend more on travel compared to previous years. One force pushing upward, and one downward. The specific impacts of these countervailing effects on individual destinations will, of course, vary. Whatever the ultimate outcome, it looks like we’re in for a very interesting year. BOT Wars! Alexa vs. Google Home: Which is the top travel planning assistant? Is Influencer Marketing Worth Your Time? Health & Wellness Travel. A Cure to the Always-on Lifestyle?